Maintaining a regular exercise routine throughout your pregnancy can help you stay healthy and feel your best. It can also improve your posture and decrease some common discomforts like backaches and fatigue. 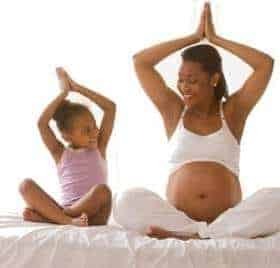 There is evidence that it may prevent gestational diabetes (diabetes that develops during pregnancy), relieve stress, and build more stamina needed for labor and delivery. If you were physically active before your pregnancy, you should be able to continue your activity in moderation. Don’t try to exercise at your former level; instead, do what is most comfortable for you now. Low impact aerobics are encouraged versus high impact. Do not let your heart rate exceed 140 beats per minute. The pregnant competitive athlete should be closely followed by an obstetrical provider. If you have never exercised regularly before, you can safely begin an exercise program during pregnancy after consulting with your health care provider. Do not try a new, strenuous activity. Walking is considered safe to initiate when pregnant. The American College of Obstetrics and Gynecology recommends 30 minutes or more of moderate exercise per day on most if not all days of the week, unless you have a medical or obstetric complication. Excessive strain and fatigue should be avoided during pregnancy. Walking play a very important role in pregnancy. Brisk walking 15-20 minutes in themselves morning and evening are most useful. Watch this video and do the exercise shown in this video if your baby is not in right position. Cycling and Swimming are also a good exercise during this period. Play games like table tennis or badminton but vigorous games and athletics should be avoided. Breathing exercise are also good at this period for the relaxation of body and mind. Doing Bhramri and anulom vilom is really beneficial during pregnancy. It is very relaxation to take a nap in themselves afternoon. At my pregnancy time i felt so sleepy after having the lunch. After a?? good sleep of 1 hour I felt so good and relaxed. Back pain is a big problem that I face in my pregnancy time. My gyno suggest me some exercises for back pain. You can refer this video to relief back pain. You should rest off and on for some time by keeping your legs up. Exercise for Cramps occur during pregnancy: Cramps can sometimes occur due to lack of blood circulation. This exercise gives a boost to circulation of blood in your lower limbs. Step1 :Stand normally. You should have about 6 feed of open space for walking. Step 2: Walk across the 6-foot space on your toes. Step 3: Then walk back on your heels. Step 4: Finally walk on the outer side of your feet. Do once every day before bedtime. Sometimes cramps can also occur due to lack of calcium,Vitamin B or E. If cramps do not get alleviated with walking ,check your diet. I m specifying the steps to get relief of cramps as I face the cramps problem almost every night during my last months of pregnancy. That time i didn’t know the proper exercise to get relief from it. But now I know the solution of it and don’t want a singal lady to face this problem. While Squatting, the pelvic inlet, outlet, and canal are at their widest. Those using the squatting type toilet are at an advantage as it exercises your joints and muscles without having to do much. Use it more frequently if you have one in the house. Squatting correctly positions the growing baby and the uterus. It also cures constipation. You can travel during pregnancy as long as you do not exhaust. Avoid traveling over bumpy roads in auto-rickshaw or in crowded trains and buses. First 3 -4 months are themselves less safest period. In this period chance of abortion is much more. So you should avoid traveling during first 3-4 months of pregnancy. Mid-morning pregnancy is themselves safest time to travel with least risk of abortion. During last one or two months of pregnancy,it is best for you to stay at home. Help you to carry the weight you gain in pregnancy. Prepare you for the physical challenge of labor and birth. Improve your mood, and give you energy. Help you to sleep better. Make getting back into shape after your baby is born easier.